I agree, you do come down the passenger side of the A pillar. My point is that you appear to hide the cable under the door draught excluder. In which case to get from the windscreen to the A pillar draught excluder you have to cross the A pillar. If, however, you remove the A pillar trim you can tie the camera cable to the wiring that is already there. This maybe is the route that you take, but it is not clear. 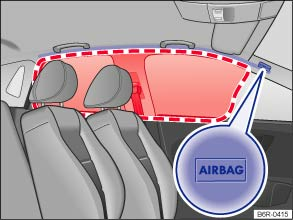 The area in the red frame is covered by the curtain airbag when triggered (deployment zone). For this reason, you must never leave or attach any items in this area. When the air bags deploy they force the A pillar trim off. To prevent it becoming a missile it is restrained by the tethering clip. Vauxhall say that this clip should be replaced every time the trim is taken off. In reality you only need to replace it if damaged. If it didn't deploy in this manner there would no danger in crossing it, or the trim, with a cable. If you have looked under the trim at the air bag you will see that it is contained within the top quarter of the trim , and its restrainig straps are secured towards the bottom of the A pillar. If it didn't throw the trim off it could not perform its correct function.